This is the first recipe using ingredients from our garden!!! We have been enjoying all our salads sprinkled with fresh dill, yumm. I have been saving this recipe specifically for our first harvest of chard. This recipe come from the NYTimes. They did a segment on Mediterranean Pie Crusts for vegetables and included a couple types and fillings. This one caught my eye becuase of the chard. It was rustic, beautiful, but a bit bland. The crust is whole wheat, but didn’t have much in it to boost flavor. 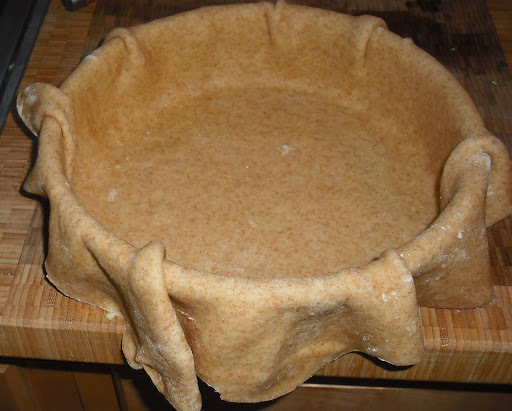 The other problem was that (hold your gasps…) I don’t have a proper “tart” pan, which is what this reicpe called for. All I had was a 10 inch cake pan. And I don’t let things like that hold me back. But I feel that it contributed to the overly doughy-ness of my version. Needless to say, a tart pan is on my wish list! Even without the right tools, it turned out gorgeous. And even without a lot of flavor, we gobbled it up and enjoyed the fruits of our labor in this Mediterranean rustic veggie tart….errr…pie. Dissolve the yeast in the water, add the sugar, and allow to sit until the mixture is creamy, about five minutes. Beat in the egg and EVOO. Combine the flours and salt, and stir into the yeast mixture. You can use a bowl and wooden spoon for this, or a mixer — combine the ingredients using the paddle. Work the dough until it comes together in a coherent mass, adding flour as necessary. Turn out onto a lightly floured surface, and knead gently for a few minutes, adding flour as necessary, just until the dough is smooth — do not overwork it. Shape into a ball. Place in a lightly oiled bowl, cover the dough tightly with plastic wrap, and allow to rise in a draft-free spot until doubled in size, about 1 hour. Turn the dough out onto a lightly floured surface, gently knead a couple of times. Shape into a ball without kneading it. Cover the dough loosely with plastic wrap, and let rest for 5 minutes. Bring a large pot of water to a boil while you stem the greens, and wash them thoroughly in several rinses of water. If the ribs are wide, wash and dice them, then set aside. Fill a bowl with ice water. When the water reaches a boil, add a generous amount of salt and the chard leaves. Blanch for 1 minute, until just tender. Using a slotted spoon or deep-fry skimmer, transfer to the ice water, then drain. Squeeze out excess water and chop. Set aside. Heat EVOO over medium heat in a large nonstick skillet, and add the onion and diced chard stems, if using. Cook, stirring, until tender, about 5 minutes. Stir in the zucchini. Season to taste with salt, and cook, stirring, until just tender and still bright green, about 10 minutes. Stir in the garlic, thyme and rosemary, and cook with the zucchini and onion until the garlic is fragrant, about 1-2 minutes. Stir in the greens, toss everything together, and remove from the heat. Taste and season with S & P.
Beat the eggs in a large bowl. 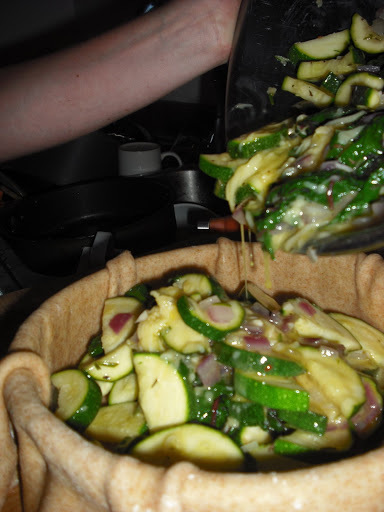 Stir in 1/4 to 1/2 teaspoon salt (to taste), the zucchini mixture, and the Gruyère. Mix everything together, add pepper, taste once more and adjust seasoning. Preheat the oven to 375 degrees. Oil a 10-inch tart pan or whatever you have on hand. Roll out two-thirds of the dough and line the pan, with the edges of the dough overhanging. Freeze the remaining dough. 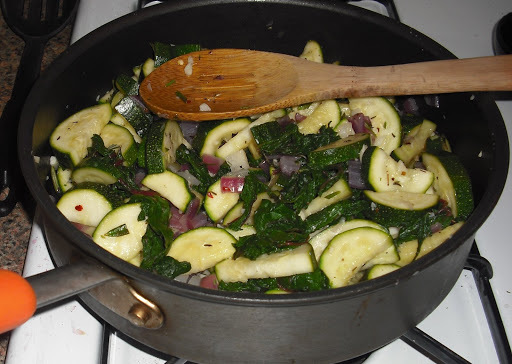 Fill the lined pan with the zucchini mixture. Pinch the edges of the dough along the rim of the pan. Place in the oven and bake 50 minutes, until set and beginning to color. Allow to rest for at least 15 minutes before serving (preferably longer). This can also be served at room temperature. 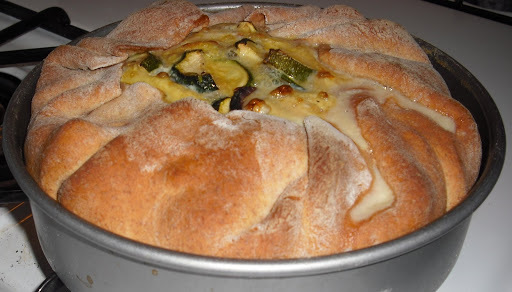 *If not using right away, freeze the dough to prevent it from rising and becoming too bready. The dough can be transferred directly from the freezer to the oven.